The purpose of the study is to investigate the impact of personality traits on leisure and life satisfaction in women who participate in exercise. This study was conducted in the relational screening model. The participants of the study consisted of 288 (M=35.35; SD=11.83) women from Antalya with the ages ranging between 17 and 70. The data of the study were obtained through the use of the following scales: The Eysenck Personality Questionnaire Revised/Abbreviated Form, Leisure Satisfaction Scale and Life Satisfaction Scale. In statistical analyses; Pearson Correlation analysis and Linear Regression analysis were used. As a result of the study; neuroticism and extraversion were found significantly correlate with leisure and life satisfaction. Other findings of this study suggest that there is a statistically significant positive linear relationship between extraversion and life and leisure satisfaction meanwhile significant negative linear relationship between neuroticism and life and leisure satisfaction. Regression analysis shows that total “neuroticism” score is one of the predictors of affection in women’s leisure (R=.15, R2=.02, F=6.68, p<.01) and life (R=.38, R2=.15, F=49.35, p<.01) satisfaction; “extraversion” score is other of the predictors of affection in women’s leisure (R=.20, R2=.04, F=12.54, p<.01) and life (R=.20, R2=.04, F=12.71, p<.01) satisfaction. According to these results, “neuroticism” explained only 2% of the variance in leisure satisfaction and 15% of the variance in life satisfaction; “extraversion” explained 4% of the variance in leisure and life satisfaction. Arslan, F., Bayraktar, G., Akdoğan, S. (2006). Beden eğitimi ve spor yüksekokulunda amatör ve profesyonel spor yapan öğrencilerle aktif spor yapmayan öğrencilerin kişilik özelliklerinin incelenmesi. Atatürk Üniversitesi Beden Eğitimi ve Spor Bilimleri Dergisi, 8(2), 40-47. Barnett., L.A. (2013). What people want from their leisure, the contributions of personality facets in differentially predicting desired leisure outcomes. Journal of Leisure Research, 45(2), 150- 191. Başol, O., Dursun, S., Aytaç, S. (2011). Kişiliğin girişimcilik niyeti üzerine etkisi: Üniversiteli gençler üzerine bir uygulama. "İş, Güç" Endüstri İlişkileri ve İnsan Kaynakları Dergisi, 13(4), 9-22. Beard, J.G., and Ragheb, M.G. (1980). Measuring leisure satisfaction. Journal of Leisure Research, 12(1), 20-33. Brebner, J., Donaldson, J., Kirby, N., Ward, L. (1995). Relationships between happiness and personality. Personality and Individual Differences, 19(2), 251-258. Brunes, A., Augestad, L.B., Gudmundsdottir, S.L. (2013). Personality, physical activity, and symptoms of anxiety and depression: The hunt study. Social Psychiatry and Psychiatric Epidemiology, 48, 745-756. DeNeve, K. M., Cooper, H. (1998). The happy personality: A meta-analysis of 137 personality traits and subjective well-being. Psychological Bulletin, 124(2), 197-229. Diener, E. (1984). Subjective well-being. Psychology Bulletin, 95(3), 542-575. Diener, E., Emmons, R. A., Larsen, R. J., Griffin, S. (1985). The satisfaction with life scale. Journal of Personality Assessment, 49(1), 71-75. Ekşi, H. (2004). Personality and coping: A multidimensional research on situational and dispositional coping. Educational Sciences: Theory and Practice, 4(1), 94-98. Emmons, R. A., Diener, E. (1985). Personality correlates of subjective well-being. Personality and Social Psychology Bulletin, 11(1), 89-97. Feist, J., Feist, G.J. (2008). Theories of personality. Seventh Edition, McGraw-Hill Companies, Inc.
Francis, L.J., Brown, L.B., Philipchalk, R. (1992). The development of an abbreviated form of the revised Eysenck personality questionnaire (EPQR-A): It’s Use among Students in England, Canada, the USA and Australia. Personal and Individual Differences, 13(4), 443-449. Francis, L. J., Brown, L., B., Lester, D., Philipchalk, R. (1998). Happiness as stable extraversion: A cross-cultural examination of the reliability and validity of the Oxford happiness inventory among students in the U.K., U.S.A., Australia, and Canada. Personality and Individual Differences, 24(2), 167-171. Gökçe, H., Orhan, K. (2011). Serbest zaman doyum ölçeğinin Türkçe geçerlilik güvenirlik çalışması. Spor Bilimleri Dergisi, 22(4), 139-145. Harden, D. M. (2008). The Five Factor Model of Personality and Leisure Experience. Unpublished Doctoral Dissertation. California State University. Fullerton. Heller, D. (2003). The Dynamic Process of Life Satisfaction: The Role of Job and Marital Satisfaction, Life Events, Personality and Mood. Unpublished Doctoral Dissertation. The University of Iowa Graduate College. Iowa. Hills, A., Argyle, M. (1998). Positive moods derived from leisure and their relationship to happiness and personality. Personality and Individual Differences, 25(3), 523-535. Hills, A., Argyle, M. (2001). Happiness, introversion-extraversion and happy introverts. Personality and Individual Differences, 30(4), 595-608. Hosseinkhanzadeh, A. A., Taher, M. (2013). The relationship between personality traits with life satisfaction. Sociology Mind, 3(1), 99-105. Howell, R. T. (2005). Models of Happiness: The Role of Personality Traits and Daily Experience in Understanding Life Satisfaction. Unpublished Doctoral Dissertation. University of California. Riverside. Karancı, N., Dirik, G., Yorulmaz, O. (2007). Eysenck kişilik anketi-gözden geçirilmiş kısaltılmış formu’nun (EKA-GGK) Türkiye’de geçerlik ve güvenilirlik çalışması. Türk Psikiyatri Dergisi, 18(3), 1-7. Kirkcaldy, B., Furhmam, A. (1991). Extraversion, neuroticism, psychoticism and recreational choice. Personality and Individual Differences, 12(7), 737-745. Kovacs, A. (2007). The Leisure Personality: Relationships between Personality, Leisure Satisfaction, and Life Satisfaction. Unpublished Doctoral Dissertation. Indiana University the School of Health, Physical Education and Recreation, Indiana. Köker, S. (1991). Comparison of the Level of Life Satisfaction of Normal Adolescents and Adolescents with Problems. Unpublished Master Thesis. Ankara University Social Science Institute, Ankara. Liu, H. (2014). Personality, leisure satisfaction, and subjective well-being of serious leisure participants. Social Behavior and Personality, 42(7), 1117-1126. Litwiniuk, A., Sadowski, J., Wilczewski, A., Saczuk, J. (2007). Motoric and personality variables of karate competitors. Research Yearbook, 13(1), 135-138. Lu, L., Hu, C. (2005). Personality, leisure experiences and happiness. Journal of Happiness Studies, 6(3), 325-342. Lu, L., Kao, S. (2009). Direct and indirect effects of personality traits on leisure satisfaction: Evidence from a national probability sample in Taiwan. Social Behavior and Personality, 37(2), 191- 192. Lyu, S. O., Oh, C., Lee, H. (2013). The influence of extraversion on leisure constraints negotiation process: A case of Korean people with disabilities. Journal of Leisure Research, 45(2), 233- 252. McKelvie, S.J., Lemieux, P., Stout, D. (2003). Extraversion and neuroticism in contact athletes, no contact athletes and non-athletes: A research note. Athletic Insight the Online Journal of Sport Psychology, 5(3), 19-27. Moghadam, M. B. (2011). Exploring relationship of personality's models and constructs of leisure. Middle-East Journal of Scientific Research, 8(2), 530-535. Motl, R. W., McAuley E., DiStefano, C. (2005). Is social desirability associated with self-reported physical activity? Preventive Medicine, 40(6), 735-739. Ruggeri, M., Pacati, P., Goldberg, D. (2003). Neurotics are dissatisŞed with life, but not with services. The South Verona outcome project 7. General Hospital Psychiatry, 25(5), 338-344. Schimmack, U., Oishi, S., Furr, R. M., Funder, D.C. (2004). Personality and life satisfaction: A facet level analysis. Personality and Social Psychology Bulletin, 30(8), 1062-1075. Yetim, U. (1991). Kişisel Projelerin Organizasyonu ve Örüntüsü Açısından Yaşam Doyumu. Basılmamış Doktora Tezi. Ege Üniversitesi Sosyal Bilimler Enstitüsü. İzmir. Wang, J., Qi, L., Cui, L. (2014). The mediating effect of personality traits on the relationship between self-concealment and subjective well-being. Social Behavior and Personality, 42(4), 695- 704. Wigert, L. R. (2001). An Investigation of the Relationships among Personality Traits, Locus of Control. Religious Orientation and Life Satisfaction: A Path Analytical Study. Unpublished Doctoral Dissertation. University of Nebraska Graduate College. Lincoln. ISNAD YAĞAR, Gül , Yerlisu Lapa, Tennur . "The Impact of Personality Traits on Leisure and Life Satisfaction in Women who participate in Exercise". 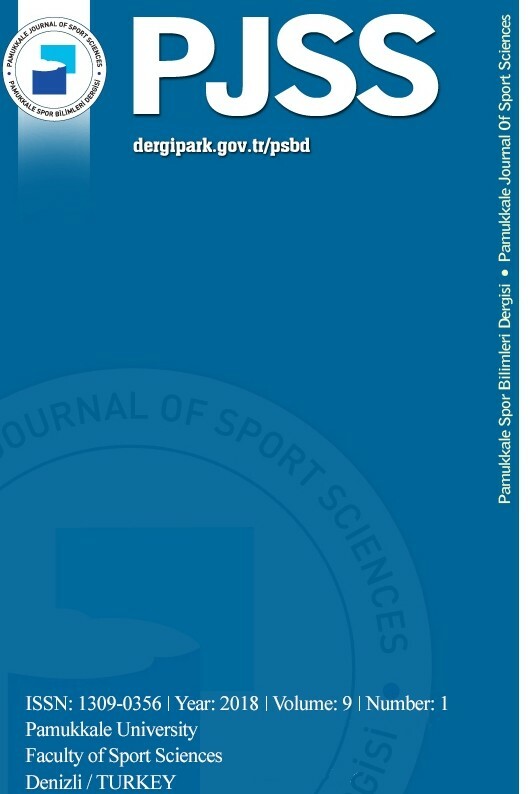 Pamukkale Journal of Sport Sciences 6 / 2 (May 2015): 65-76.